After 82 days at sea, a 57-year-old blind man from South Brent, Devon, finished rowing across the Pacific Ocean with his teammate. The race began in Monterey, California, this June and was to be 2,400 miles to the finish line in Hawaii. 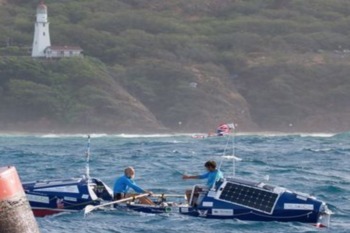 However, severe weather conditions meant the pair would row approximately 3,000 miles before it was all over. Steve Sparkes is the first blind person to row across the world's biggest ocean. "The rewards having achieved it far outweigh any downside and has made me feel exceptionally boosted. I am sure that feeling will last a long time." The San Diego Center for the Blind offers several innovative programs for helping people living with blindness.